There are facts about soil that are very important for farmers and gardeners. Soil is a living organism that covers the majority of our planet. Read on to find out exactly what soil is and what it can do for your plants. Soil is made up of organic matter, both living and dead as well as minerals and nutrients, gasses and liquids. According to the United States Environmental Protection Agency, it takes approximately 500 years to create one inch of topsoil. Amazingly, there are over 70,000 types of topsoil that have been identified in the United States alone. Many people wonder why there are so many different types of soil. The answer lies in the area in which we live and our climate, which includes water and temperature conditions. Silt, clay and sand affect the texture of soil, and the richness of soil is largely dependent upon the types of organic matter available in the area, as well as wildlife and earthworms that till the soil. Under the oceans, ground exists, but is it soil? The United States Department of Agriculture's Natural Resources Conservation Service (NRCS) states that soil exists in up to two and a half meters of water. After that depth of water, it is no longer considered soil. 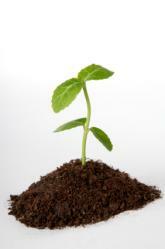 Soil needs to be able to support a living plant with roots in a natural environment. For farmers, the types of soil that exist where they live are very important. Considering that the earth is covered in so many types of soils, how do farmers determine what will grow in their soil? Soil types can be determined by tests performed by an individual or by specialists. Researchers, especially those working for government agencies like NRCS, spend a great deal of their time typing soil for people who work the land for a living. Knowing the facts about soil in a particular area will help farmers decide where certain plants will flourish and if they need to treat their soil in order to make it more welcoming for plants. Soil can be treated with other minerals and nutrients to alter the pH balance of the soil. Studying the pH of soil is to research the amount of hydrogen ions in the soil. The pH balance of soil, which means the alkaline or acid content of the soil, is based on a scale that cites 7 as the neutral point, 0 as the low point and 14 as the high point. If the pH of the soil is below 7 it is considered to be acidic while if it is above 7 it is alkaline. Plants prefer a certain type of soil in which to grow in. If the soil pH is outside of the favored limits for a particular plant, it is likely that the plant will die, or fail to thrive as expected. Farmers and gardeners alike can change the pH balance of their soil, which can improve the nutrient levels. When soil is treated to bring the pH balance into an acceptable range for a plant, the farmer or gardener can expect the plant to grow as well as its counterparts where it is found indigenously. However, treating the soil is only one part of the big picture for plant growth. Temperature and water conditions can still cause a plant to die. Rotating crops to replace nitrogen or other nutrients and allowing soil to "rest"
Testing your own soil in your yard, garden or crop field can be done by both the layman and professional. Soil testing kits can be obtained in many retail gardening stores or by requesting them from soil testing labs from the area in which you live. Retail soil testing kits are inexpensive and can be conducted quickly. Soil tests that are done in conjunction with a soil-testing lab may be more expensive, but the results will be thorough and conclusive. Soil isn't simply dirt; it is an ever-changing living organism that requires care in order for plant life to survive within it. Soil can have its' pH altered by adding certain minerals or nutrients; however it will usually return to its previous pH when left alone for several years. The climate and amount of water in a given area will greatly determine the pH level in the soil. The best way for anyone to find out the facts about soil that they have is to test it. Soil tests will determine the pH level and allow farmers or gardeners determine whether they want to treat the soil or to search for a different place in which to put their plants.